The European Union is quietly increasing the urgency of a plan to import natural gas from Iran, as relations with Tehran thaw, while those with top gas supplier Russia grow colder. Two “ifs” – the removal of sanctions on Iran and the addition of some pipeline infrastructure – are not preventing EU planners preparing, a European Commission source involved in developing EU energy strategy told Reuters. Russia is currently Europe’s biggest supplier of natural gas, meeting a third of its demand worth $80 billion a year. The EU has imposed sanctions on Moscow over the conflict in Ukraine, increasing the need for gas from elsewhere. While sanctioned itself, Iran has the world’s second largest gas reserves after Russia and is a potential alternative given talks between Tehran and the West to reach a deal over the Islamic Republic’s disputed nuclear programme. “High potential for gas production, domestic energy sector reforms that are underway, and ongoing normalisation of its relationship with the West make Iran a credible alternative to Russia,” said a paper prepared for the European parliament. However, the paper added that Iran was not a credible alternative energy supplier in the short-term due to sanctions and large infrastructure needs before exports become viable. Internal EU energy security documents seen by Reuters also describe plans to tap new non-European gas import sources in central Asia, including Iran. Iran, exploiting the reversal of old enmities caused by the upheaval of the Islamic State militants in the Middle East, is also keen to sell its gas. 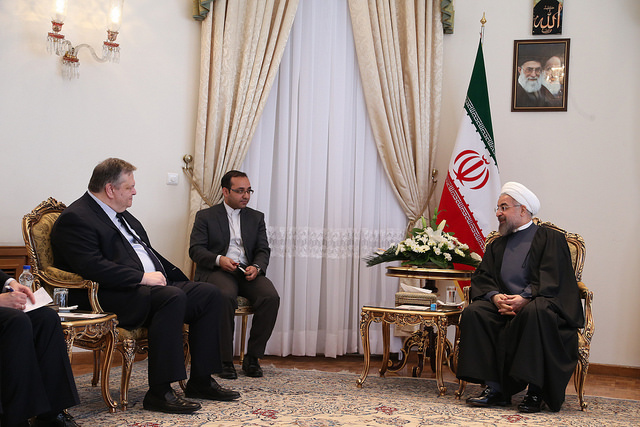 “Iran can be a secure energy centre for Europe,” its President Hassan Rouhani was quoted on Wednesday telling Austrian President Heinz Fischer in New York. Tehran’s assertions over reliable supply are likely to ring alarm bells at Russia’s giant Gazprom, after interruptions to its exports via Ukraine in previous disputes scared Europe. “Iran is trying to position itself in Europe as an alternative to Russian gas. It’s playing a very sophisticated game, talking with Russia on the one hand about cooperation on easing sanctions and also talking to Europe about substituting Russian gas with its own,” said Amir Handjani, an independent oil and gas specialist working in Dubai. “Given Russia’s current strategy politically, which is one of confrontation with Europe, I see the EU having little choice but to find alternative gas supplies,” he added. The lifting of sanctions on Iran – the game changer – is unlikely to be soon. Diplomats are pessimistic over the odds that Iran and world powers will conclude a final agreement by a 24 November deadline. Iran and six world powers – the United States, Britain, France, Germany, Russia and China – are trying to hammer out a long-term nuclear accord that would bring an end to international sanctions that have crippled the Iranian economy. Analysts say Iran has already lost out on lucrative liquefied natural gas (LNG) exports in Asia, where customers pay the highest prices, to Gulf rival Qatar, so Tehran has to look to Europe. “Iran’s interest to deliver gas to Europe is very big. Parts of Iran’s economical and political elite as well as Western companies are preparing for an end of the sanctions,” said Frank Umbach, energy research director at King’s College in London. Mark Dubowitz, of US think tank Foundation for Defense of Democracies, said Iran was looking to exploit the situation in both Iraq and Russia to get concessions out of the West on the nuclear track. “Washington should be wary of any attempt to further erode its negotiating position by opening up any more economic escape hatches for Iran until a comprehensive deal is reached, and enforced, that dismantles Tehran’s military-nuclear programme,” said Dubowitz, who has also advised U.S. lawmakers on sanctions. The US State Department had no immediate comment. The most feasible route for Iranian gas to Europe would be via Turkey, already a customer, although the existing Tabriz-Ankara pipeline would not be big enough for major exports. Iran has long lobbied to build a designated pipeline that would connect its huge South Pars gas field with European customers – the so-called Persian Pipeline. Investors in Europe, as well as the European Commission, favour the cheaper, and politically less controversial, option of importing Iranian gas to the EU via Turkey through extended pipelines that already exist or are currently being developed. Energy majors Total of France and Italy’s Eni have in the past expressed interest in developing South Pars, one of the world’s biggest gas fields, shared by Qatar and Iran, with total reserves estimated around 50 trillion cubic metres (tcm), enough to meet European demand for over 100 years. Independent feasibility studies show that if sanctions were to be eased and investments started soon, Iran could supply 10-20 billion cubic metres (bcm) of gas a year to Turkey and Europe by the early 2020s. Diplomats are in place to ease a potential major shift in global energy trade. “Our main point of contact with the Iranian government is through its embassy in Berlin, and its new ambassador there is a former member of Iran’s energy ministry,” the Commission source said. Ali Majedi was named in July as Iran’s ambassador to Germany. Before that he was deputy oil minister in charge of international affairs. Majedi could not be reached for comment. The West has responded with successive waves of sanctions. The latest was imposed on 12 September, both by the EU and the USA. “The European Union is quietly increasing the urgency of a plan to import natural gas from Iran” ???!!!! Downgrading to worsens ! That’s the E.U. we are facing today!! What a joke ! All things about energy-independent ! They even don’t take it’s own shale gas into consideration ! Is that the E.U. Council we have today ? Which worsens economy , energy …basically in all sectors ! 7 Years damaging economies with national plenty of sh*t ! That’s not an european Council banymorel ! Nothing that the “E.U.” citizens can be proud about such a decision !